Japan's Hayabusa2 spacecraft successfully sent a bomb down to the surface of Asteroid Ryugu on Thursday, paving the way for scientific studies of the space rock's interior. Why it matters: If the bomb did explode as expected, creating an artificial crater on the asteroid, scientists will be able to get a sense of what the rock is comprised of beyond just its irradiated surface. If the area is deemed safe, Hayabusa2 will move in to possibly land at or near the site of the artificial crater to collect a sample of the blasted material for eventual return to Earth next year. Details: In order to protect the mothership from the blast, Hayabusa2 flew behind the asteroid after dropping the copper bomb, according to the Japan Aerospace Exploration Agency (JAXA), but a secondary camera was deployed in order to check out the moment the experiment — called the Small Carry-on Impactor (SCI) — went off. "After the start of the operation, the camera (DCAM3) separated from Hayabusa2 captured an image that shows ejection from Ryugu’s surface, which implies that the SCI had functioned as planned," JAXA said in a statement. "Hayabusa2 is operating normally. 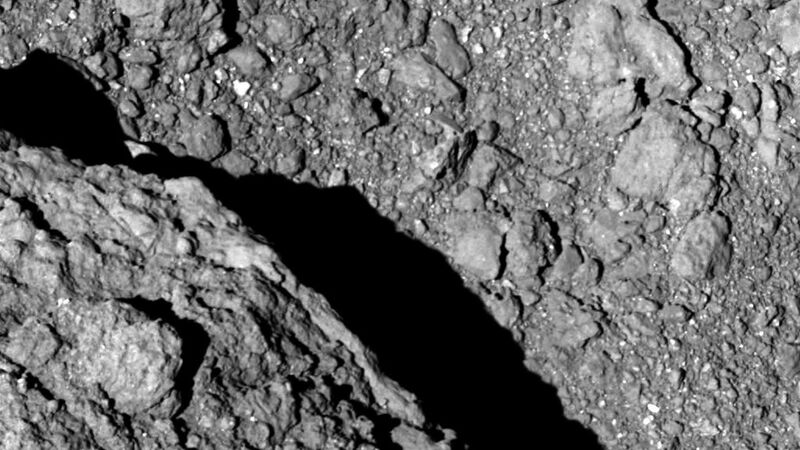 We will be providing further information once we have confirmed whether a crater has been created on Ryugu." Background: Hayabusa2 has been studying asteroid Ryugu since last year, after launching to the space rock in 2014. The hardworking space probe already collected one sample of the asteroid in February and made history in 2018 when it sent robotic probes to the surface. The spacecraft is designed to help scientists learn more about the origins of the solar system as asteroids are thought to be bits of debris left behind after the formation of the planets.